2018 SUMMER CAMP DATES ARE UP! See our YOUTH PROGRAMS - SUMMER CAMPS page to get information on the 2018 summer camps being offered at Greenridge Equestrian Center! Deposits can be mailed in or brought by to reserve your spot! 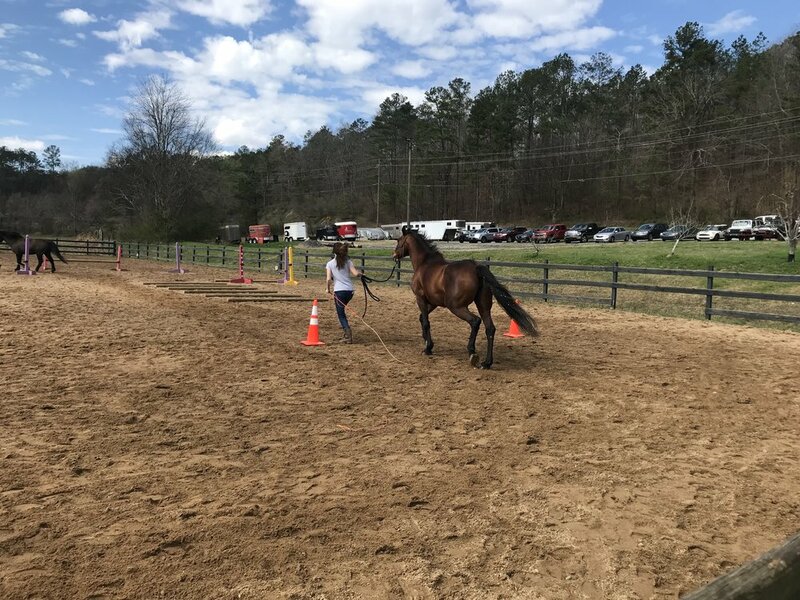 Laurie Wilson held an informative clinic on Natural Leadership Horse Training at Greenridge Equestrian on February 24, 2018. The atypical warm February weather made for a perfect day of learning the foundations of basic groundwork along with some fun obstacle challenges. 10 riders represented Greenridge Equestrian Center at the 2017 GAHA Open Fall Sport Horse Show at Foxberry Farm. It was a very full day that resulted in many ribbons and prizes for our riders! Congratulations on a successful competition, Aline Davis, Tabitha Dentice, Griffin Deyo, Beth Ellenberg, Kaitlyn Ives, Kathryn Leak, Madison McElrath, Halle Rentz, Lauren Rousell, and Sadiyah Williams! You can see a wonderful article posted on Facebook by WARhorses - Women of Age Riding Horses, about Griffin Deyo's jumper round on her horse, Music! Greenridge Equestrian Center was represented at the September 9th North Atlanta Equestrian 3-Phase Show by Aline Davis and Griffin Deyo. Both girls competed in Combined Training and Show Jumping events and made the Greenridge family proud! The weather is starting to cool down and it is time for our boarders and students to show their skills at some fall shows and events! Check out the Calendar page for upcoming events and join us!